Lacock Village with the Red Lion Insignia in the foreground. Public Houses or Pubs are quite a common sight around the United Kingdom. 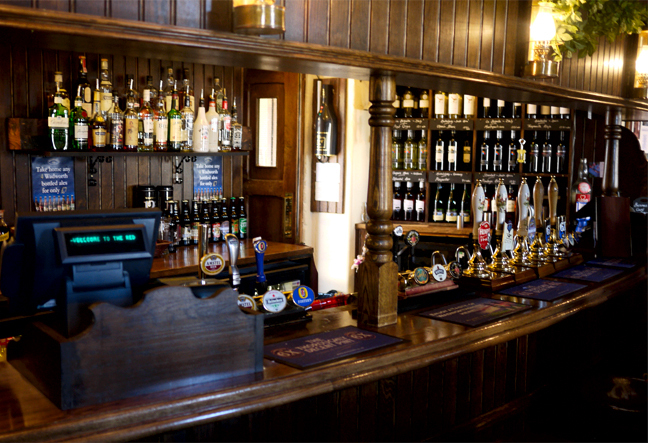 Pubs are basically establishments that serve liquor including Cask Ales and Draught Beers, Food and, even dessert. C and I visited quite a few during our visit but one of the standouts was the Red Lion. 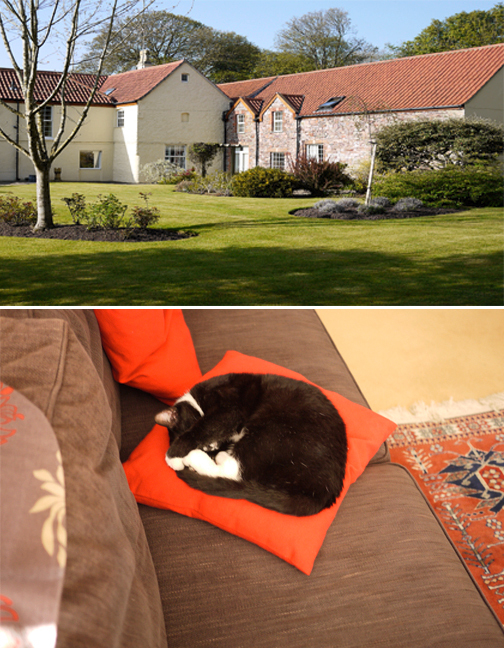 Aside from it being a pub, The Red Lion is also a fully functioning bed and breakfast. 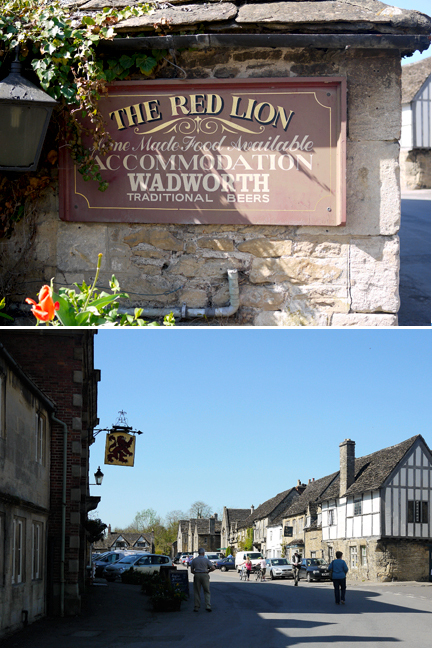 The Red Lion is located in the historic village of Lacock, about an hour’s drive away from the lovely 18th century home of our gracious hosts Keith, Sue and Matthew Sawyer in Bristol. Bristol was our base for the first leg of our stay. Lacock was of interest to us as it is the site of Lacock Abbey where many scenes of the Harry Potter movies were shot. My daughter S is a big Harry Potter fan, so a trip to Lacock was a must. Our hosts suggested that we hire a car and driver for our stay in Bristol as it would be the most convenient means of transport around the area. Our amiable driver Joe picked us up early that morning for our trip to Lacock. Having lived in Bristol all his life, Joe kept us busy during the long drive with stories about life in the UK while pointing out different points of interest on the way. My biggest concern was that I had not done any research on where to eat in Lacock. After communicating this fact to Joe, He nonchalantly replied: “Not to worry we can wing it”. I immediately had visions of over-fried fish and dry sausages, but I quietly put those thoughts at the back of my mind and hoped for the best. We arrived at Lacock at around 10:30 and subsequently spent a couple of hours looking around the Abbey. We then decided to break for lunch and we walked towards the center of the village. Then I saw the sign: The Red Lion. In the spirit of winging it, I said: “Let’s eat there” and so we then proceeded to have one of our most memorable meals of our trip. In most pubs ordering is done on a “pay as you order” basis at the bar. Food is then prepared and served to you at your table. 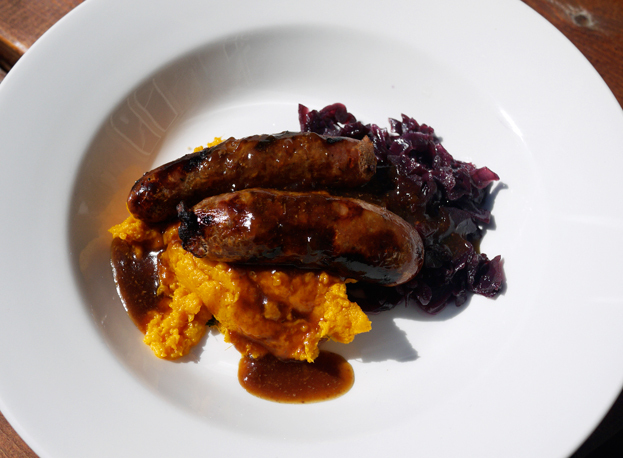 I decided on a Trio of Wild Boar and Apple Sausages with a Sweet Potato and Thyme Mash, served with Braised Red Cabbage (£6.95). This was paired with a pint of Wadworth Swordfish Ale (£3). The sausages tasted exceptional. One bite and I knew that it was freshly made with slight gamey undertones that did not make me forget that I was eating wild boar. The Apple bits that were mixed in further enhanced the flavor profiles, while the Sweet Potato Mash was an apt accompaniment. Special mention must be made about the Swordfish Ale. Joe recommended this to me out of all the Ales available as he said, “It will give you a taste of Bristol”. I took his word for it and I was impressed by its crisp, slight malty flavor accentuated by its amber hue. I was hoping to come across Swordfish Ale again as our trip progressed, unfortunately I was not able to find it again. 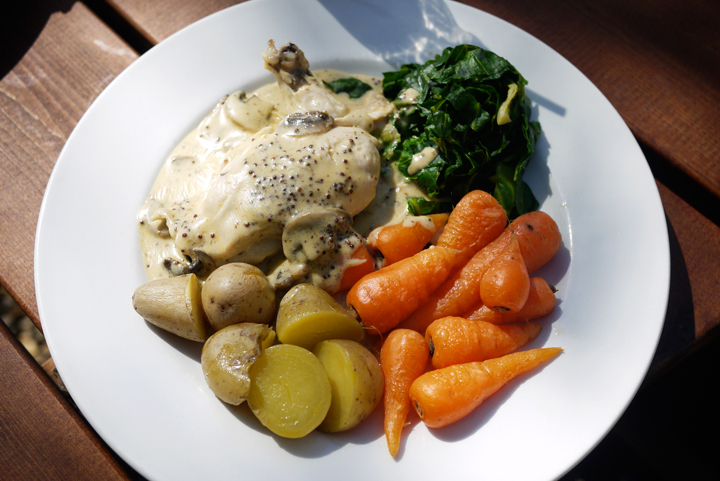 C decided to have the Pan Fried Chicken Breast with a Stilton and Bacon Cream Sauce served with Seasonal Veggies and Saute Potatoes. (£11.95) I was able to try a bite of her food and I found the chicken moist and the Stilton Cream sauce delightful. What I really enjoyed though were the whole baby carrots that were served on the side. They had a color of an almost translucent orange and had this sweetish earthy taste. It took all of my will power not to finish all of it. The kids decided to share an order of Wadworth 6X Beer Battered Fish and Chips, Peas and Home Made Tartare Sauce. 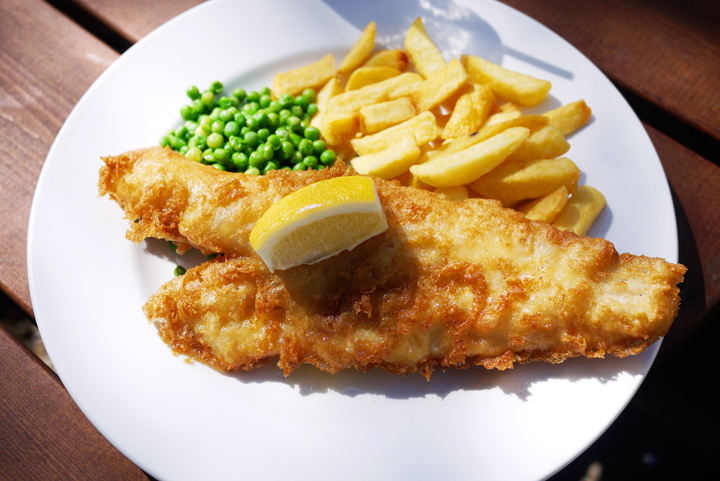 (£9.95) Their slice of Haddock was flaky, moist and not at all oily. Fish and Chips is one of the favorite dishes of my daughter S. She did have it again and again through our trip, including in a couple of highly rated fish and chip restaurants in London. She always said that the best she ever had were the fish and chips at the Red Lion. There you go, a full endorsement from a certified fish and chips lover. Looking back, I fully regret not having dessert. Judging from the quality of the food I would think that the desserts would be just as good. I remember contemplating ordering either their Award Winning Sticky Toffee Pudding or the Whim Wham Trifle. But my tummy was full and we still had a long day ahead of us. So I decided to skip dessert. Although I feel a bit shortchanged, I now have something to look forward to when we go back. Yes, I want to go back to Lacock just to eat at the Red Lion again. And this time I will order two desserts. We visited quite a few pubs during our entire stay. Among the more notable ones where the White Hart, one of Edinburgh’s oldest pubs dating back to the 16th century and the historic George near London Bridge. The George counts Dickens and Shakespeare as some of its more distinguished habitues. However nothing could compare to our experience at the Red Lion Inn in terms of food. In my opinion, everything else just did not measure up. I would like to thank our driver Joe for making me realize that sometimes winging it is not such a bad thing.